This startling looking plant is a real statement plant. Its reflective silver gray heavily spined foliage really stands out and is crowned by terminal mauve blue flowers that are much loved by bees. 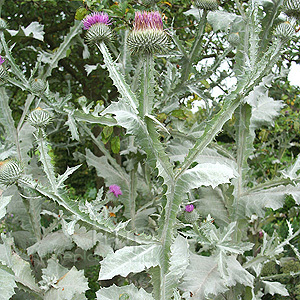 Cultivation tips: Scotch Thistle is a fast growing biennial that grows onwards and upwards at a startling rate. It will tolerate any well drained soil in full sun and it will freely spread among other herbaceous plants. This plant requires staking and a sheltered location. Plant towards towards the back of the border and allow to grow up through surrounding plants.